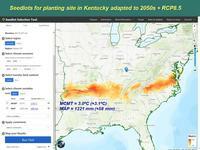 The Seedlot Selection Tool (SST) is a web-based mapping application designed to help natural resource managers match seedlots with planting sites based on climatic information assuming that plant populations were in the past adapted to their local climates. The SST can be used to map current climates or future climates based on selected climate change scenarios. It is a powerful tool for planning reforestation and restoration strategies for responding to concerns of climate change. This webinar will provide an introduction to the tool and how to use it. Examples will be presented for eastern North America.